Historian Jim Claven will tell the story of Gunner James Zampelis, Australia’s only Anzac of Hellenic heritage to die in the defence of Greece in 1941, in a lecture he will give at the Greek Centre, on Thursday 11 August 2016, as a part of the Greek History and Culture Seminars offered by the Greek Community of Melbourne. The son of Greek migrants from Lefkada, St Kilda-born James represents the multicultural essence of Australia. Mr Claven (photo) will recount James’ story from Melbourne to the defence of northern Greece, through the retreat and embarkation to Crete and his death on Crete in May 1941. He has recently returned from Greece, following James’ (photo, left) route and will tell of re-newed efforts to honour James’ service in Greece and in Australia. 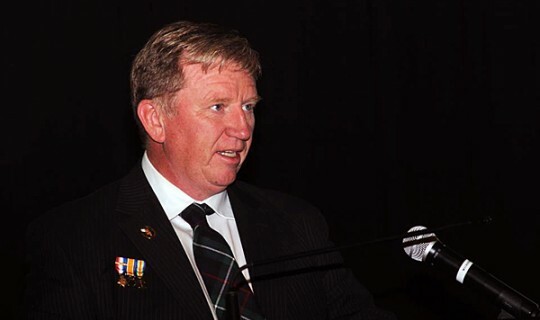 A former veteran’s affairs adviser, Mr Jim Claven is a historian with degrees from Melbourne’s Monash University, a freelance writer and Secretary of the Lemnos Gallipoli Commemorative Committee. He has researched the Hellenic link to Australia's Anzac story across world wars, producing many historical articles and leading commemorative tours of Greece’s Anzac sites. Last year the Committee erected a new memorial at Albert Park commemorating Lemnos' role in the Gallipoli campaign. Jim is currently working to produce a major new commemorative publication on Lemnos and Gallipoli. He is an associate member of the RSL Victorian Branch, his grandfather having served in the First World War, as well as being a member of the Battle of Crete and Greek Campaign Commemorative Council. He recently took part in the commemorative events held on Crete and at Kalamata to mark the 75th anniversary of that campaign.